In Russia, Sept. 1 is the Day of Knowledge, a joyous annual event marking the start of the new school year. But Knowledge Day 2004 was different at School No. 1 in Beslan: A group of heavily armed rebel extremists stormed the school, holding more than a thousand children and adults hostage in a sweltering gymnasium for three days. The harrowing siege ended Sept. 3 in a series of explosions and hail of gunfire that killed some 350 people - half of them children. Featuring heartbreaking interviews with more than a dozen young survivors, as well as chilling footage shot by the hostage-takers themselves, Children of Beslan explores the devastating impact of violent conflict on children. Through the words of those left orphaned and bereft of family and friends, details of the 57-hour siege emerge, from the confusing first moments, when pupils heard noises they thought were balloons popping, to the numbing hours and days in the overheated gymnasium, to the devastating final hours, when bombs taped to walls and suspended from ceilings went off, and hundreds of panicked hostages, bullets flying around them, began scrambling over the bodies of victims in search of safety. Ranging in age from six to 12, the kids recount the events that robbed them of their family, friends and innocence - describing experiences that are chillingly familiar. The Beslan siege ultimately killed more adults and children than the tragic 2002 Moscow theater siege by Chechen extremists (chronicled in the 2003 HBO documentary Terror in Moscow). Most surviving children now study at another school in town, with some fearful parents still accompanying them to school. The children's scars, visible and hidden, remain. "I have fewer friends than I used to," says Carat. "The ones who survived - we're not the same funny kids we used to be, we're serious now. We're already grownups. We don't fight any more... Even little boys became adults. Kids understand everything." Produced and directed by Ewa Ewart and Leslie Woodhead; executive producers for the BBC, Alan Hayling and Fiona Stourton. 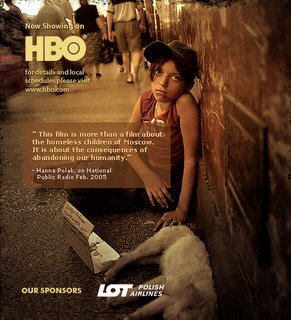 For HBO: supervising producer, Lisa Heller; executive producer, Sheila Nevins. © 2005 Home Box Office, Inc. All Rights Reserved. Beslan Terrorist: "I didn't want to kill"
Charity raising funds to help the children affected by Beslan terror act. Information on the foundation, past projects and their mission. takes an intimate and heartbreaking look at a group of homeless children living in and around a Moscow train station. authorities with alarming statistics about homelessness and its devastating effects in post-Soviet Russia.